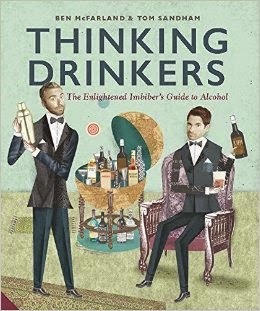 Ben McFarland & Tom Sandham are known throughout these lands as the Thinking Drinkers. While Ben has been crowned British Beer Writer of the Year a triad of times, Tom is former editor of a cocktail magazine called CLASS. Together they do a variety of things including writing (as demonstrated in this book), tasting sessions for those who want to learn more about booze & performed in shows from Edinburgh to the London West End. The whole point of this book is to encourage people to Drink Less but Drink Better, which is a bloody good mantra and one that many of us have fallen foul of in the past. Anyway, this brilliant book takes you through all of the main food drink groups… you’ve got beer, wine, whisk(e)y, gin, tequila, vodka… everything. Every chapter gives you insight into the history of each beverage, along with amusing segments on famous people who are renowned for drinking said drinks, cocktails, recommendations and general hilarity! The whole book is so captivating and I have now found myself interested and filled with knowledge on drink topics other than my core one of beer. The great thing is that it’s not just a book for reading, but one for reference. It’s the kind of book that I think every pub or bar in the country that prides itself on stocking artisan or craft spirits should have on the bar, not only to further their own personal knowledge but to allow customers to read. All in all, this book is brilliant and will be a perfect Christmas present for anyone who likes a drink or two!